Damp. Moist. Clammy. Those words describe me perfectly for hours after I run these day. August brings us dog days here in the south, and apparently, the dogs like it hot and humid. The kind of humid that means you’re never actually dry, no matter what time of day it is. My man and I work about 10 days every month on the road together, much of those days spent outside, in convenience store/gas station parking lots. (We do compliance inspections for several companies around the state – long, boring story, but I do like the work.) He’s actually on the road without me another 10 or so days a month, so he’s in the heat all the time. I can stand the heat fairly well, and he does even better. Still, we’ve leaned that our aging bodies have to stay well hydrated when we sweat as much as we do, so we pour on the water, Nuun, and Powerade. We try to eat our water, too, although I’m better at that than he is. Probably because I have never met a meal I couldn’t learn to be friends with. I love the fruits of summer; watermelon, cucumbers, tomatoes all help my rehydration process, so I eat them with abandon. When I feel the worst is typically after a really hard week of work, runs, and playtime. 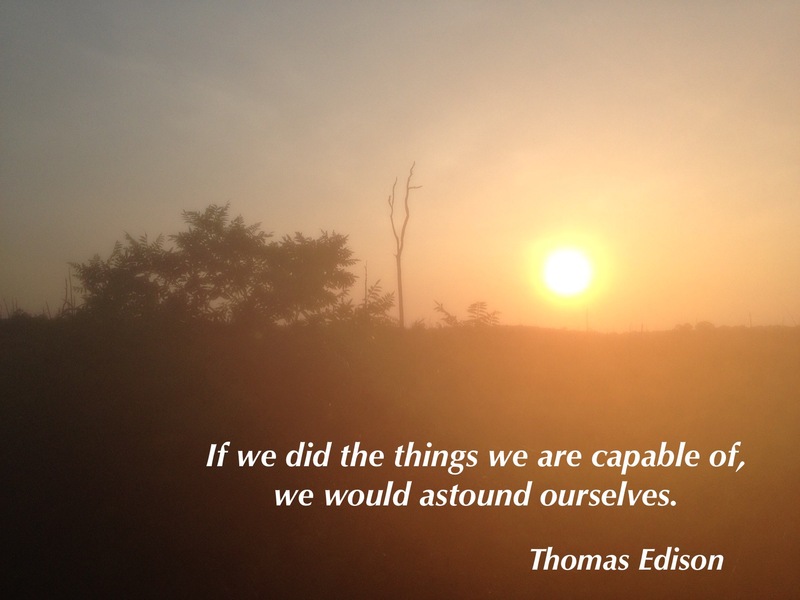 Last week found me dragging by Friday, and my run that morning was unspectacular. It was short (two miles), and I was dragging and dripping at the end. I took a cold bath and drank lots of water with Nuun. Then, I took a nap. That’s how I knew I needed a rest day, so, even though my Saturday training plan called for my “long” run, I slept in, and took it easy all day. Well, I vacuumed. But, other than that, nada. Legs up, cool bath, lots of water with Nuun, some cukes and tomatoes, and, bingo. I was better by Sunday and had a very good, strong run. Learning to listen when my body talks to me and know when its not lying has been a process. I still want to believe it when it tells me I’m too tired to run as my 5 am alarm goes off. More often than not, though, that’s a lie. I have to shut those voices down and make myself get up and head out the door. That’s when my strategy of having every item I’m putting on my body laid out the night before really comes in handy. If I have to dig for a sports bra, it ain’t happening. My body grumbles for at least the first ten minutes, sometimes more on these hot, muggy mornings. Then, it punishes me afterward by not cooling off and making me sit in a puddle of sweat, even after a cold shower, drinking ice water, and with a fan. Like this morning. As I type this, sweat is sliding down my fingertips and causing me to have to stop and mop up the mess so my keyboard won’t stick, making the shower I took after my run an exercise in futility. One thing I know, though. It will be cool again. Then, cold. And, my body will scream even more loudly when I make it get up and go run. I’ll cross that frosty bridge when I come to it. For now, these dog days are making me stronger. I feel it in the way I’m moving, the way I feel after a run, the energy I have after a 12 hour day in the heat with my man. Got to love that. I don’t have it every day, but that’s how I can tell I’m due a rest day. And, maybe a cupcake. I’ve never been mistaken for an athlete. In high school, I think I was probably thought of as the “smart one”, simply because I pulled off a clever ruse. By being bookish and nerdy (way before that was cool), I was mistakenly thought of as smart. I’m not smart. But, I do read a lot. And, I’m teachable. So, there’s that. But, no one EVER mistook me for an athlete. Because, I wasn’t one. I was 50 before my inner athlete decided to come out and play. There are pros and cons to that. Pros include never having to look back and mourn for the days when I was really fast. Because I wasn’t. I’m still not. Cons include not having that inner voice built into my head that so many lifelong athletes seem to own. My mind can defeat me in ways my body never would. I think lifelong athletes have an advantage, in that they learn to dominate the voices in their heads at an earlier age. I’m still listening to mine and letting them have their way. My man and I are on “vacation” this week. If you’re self-employed, you know there’s really no such thing. Gary has fielded calls and returned e-mails all week, but we’ve managed to mostly just do what we wanted to, and we can cram a LOT into a week. I’ll probably need to sleep for 72 hours just to get rested up when we’re back home. Our daughters were here (Orange Beach, Alabama) for the first part of the week, staying at my sister’s condo, while we “roughed” it at Gulf State Park in our new camper. We crammed a lot into the first days of the week while they were here, running trails, learning to paddleboard, kayaking with dolphins, and taking the girls out for a refresher dive, as they haven’t been in a while. We grilled, watched movies, and generally enjoyed being a family, which is a rare treat when your kids are grown. We enjoyed our time with them, but always, in the back of my mind, was the knowledge that this was Week 1 of my half marathon training. So, we ran. I haven’t raced in two years. Wow. Two years. That seems like a really long time. I’ve been running over that time, just not with any particular goals in mind. I needed that time to push the reset button. Maybe everyone needs to do that, or maybe it’s just me. 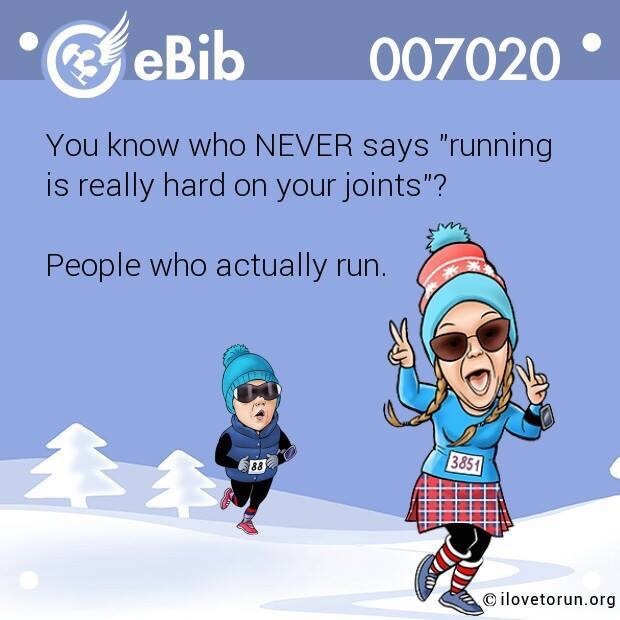 Whatever, I know it has really helped to get me in a better place with my running. I’m finally ready to race again. I’ve selected a fall half marathon. Gary and I are training together (sort of), and I’ll be depending on him heavily come race day. My goals for this race are: 1) Finish. 2) Be smiling in my race photos. 3) Start and finish the race injury free. That’s it. Simple, right? Towards that end, I’ve selected an entry level training plan that is based on a run/walk system. Having built my base since the first of the year, I’m actually a little past the first couple weeks of the plan, so we’ve been winging it this week, adding a lot of miles that the plan doesn’t include. Of course, we’re on vacation, and doesn’t everyone return from vacation exhausted and sore like we do? I think the most valuable lesson running has taught me is: don’t wait until the moment is right to live life. You may never shed that 10 (or 30) pounds, and won’t you be sorry if you get to the end of your days and you never kayaked with a dolphin, or learned to scuba dive, or stood up on a paddle board? Or, whatever your thing is. Grab life by the tail and swing it hard. And, make sure it lands where you want it to. 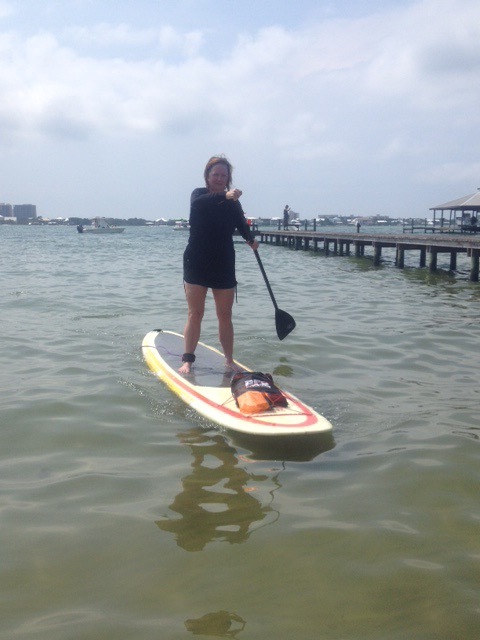 If I can stand up on a paddle board and stay upright (mostly), anyone can. As an avid outdoors woman, I believe in taking care of the environment. If I pack it in, I pack it out. I often pack out more than I packed in. But, on this road to 13.1, I intend to leave a lot of trash along the way. If you’re running behind me, be careful not to trip over the doubt I plan to drop, or the fear(s) I’m leaving behind. I plan on picking up a few things as well. The joy of a quiet sunrise in the company of my man, the peace of an early morning run with just the sound of my feet to keep me company, the confidence that comes from making a plan, then working hard to make it happen. Because, as excited as I am about the race, I confess the part I look forward to most is the journey toward it. The slow build up of strength and courage that culminate in a race run well, but more importantly, in a life lived fully. No doubt. No fear. Just a life filled with faith. I’m still never mistaken for an athlete. That’s okay, because I know that sporty girl is there, just waiting to come out and play. She’s alive and well; fearless and strong. She’s living the good life.